Large data analysis can improve decision-making in critical areas of development, such as health, employment, productivity, safety and natural disaster management, to name a few. But for this, new partnerships must be generated among all the actors involved and promote true educational and cultural revolutions. Addressing these novel trends in national information management to monitor the progress of countries in achieving the Sustainable Development Goals (SDGs) also requires debate and reflection on the new tools, capacities and management mechanisms necessary to the implementation process. 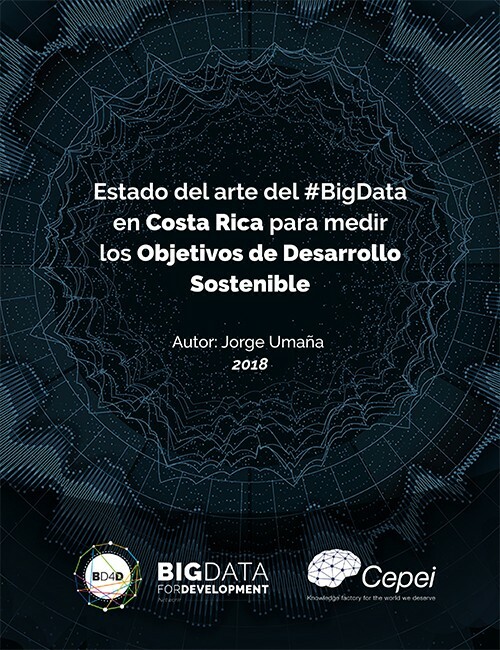 This document makes a general review of the national context regarding the use of big data to measure SDG indicators, first making a contextual recognition of the national data ecosystem and the use of non-traditional sources of data used in Costa Rica. Likewise, it seeks to bring the reader closer to a conceptualization of the term and characteristics of big data, in order to raise awareness of its importance to the 2030 Agenda, and what has been the progress from the vision of some relevant national actors, who generate training, research and implementation of big data tools. It also recognizes the challenges the country is facing and the different social sectors for production, use and collaboration that allow the use of big data in the measurement and evaluation of the sustainable development agenda in Costa Rica. The use of big data implies true revolutions in the educational and cultural spheres, which requires both institutional and academic modernization processes to face the new challenges. The greatest difficulty will be working with the private sector; Due to their nature of competition and utility in the market, they will have restrictions on sharing not only experiences, but data. Among the challenges that exist regarding the analytics of large volumes of data is the ethical responsibility that demands their use and the barriers in accessing public and private data. In this regard, it is necessary to create and formalize multisectoral partnerships that generate trust and consolidate public and private cooperation. Digital technologies as a tool for the implementation of public policies generate positive impacts, since they can promote democracy and sustainable development in the region. Under this premise, it is necessary that the Government of Costa Rica improve its digital governance policies to direct transformation processes into initiatives of greater value for the use of data.